If such were the case, then people from Taiwan are simply some of the most beautiful dreamers on this planet. During the month of February of 2015, I had the opportunity to visit Taiwan. Its neighboring states include the People’s Republic of China to the west, Japan to the east and northeast, and the Philippines to the south. 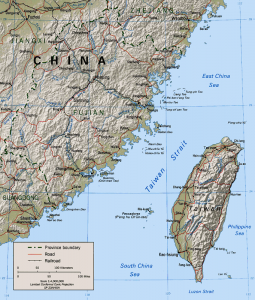 Its former name Formosa dates back to 1542 when Portuguese sailors sighted the main island of Taiwan and named it Ilha Formosa, meaning “beautiful island“. Taipei is the seat of the central government. New Taipei City, encompassing the metropolitan area surrounding Taipei proper, is the most populous city. During the latter half of the 20th century, Taiwan experienced rapid economic growth and industrialization and is now an advanced industrial economy. Taiwan is one of the Four Asian Tigers and a member of the WTO and APEC. Its high-tech industry plays a key role in the global economy, enabling its status of being the 21st-largest economy in the world. Considering the fact that Taiwan only has a total area of 36,193 sq km (or 13,974 sq mi), its residents/citizens must be magical. Upon closer examination, one realizes some of the significant contributing factors to Taiwan’s success story: it is ranked highly in terms of freedom of the press, health care, public education, economic freedom, and human development. To summarize my overall impression of Taipei, Taiwan: it is one of the most civilized 21st century cities in the world! It is a city where people are polite, orderly, and considerate, with the cleanest subway system I’ve ever seen where not a single piece of trash could be found ! It is not surprising that one would be able to find some of the most progressive and aesthetically intriguing architectural designs in Taiwan, as seen above and below in the Agora Garden Tower design by Vincent Callebaut Architectures SARL and various projects. It is a new sustainable residential tower in Taipei currently under construction to be completed in 2016. In the center of Xinyin District of Taipei, the Agora Garden project (as the name suggests, Agora, in ancient Greece, means a public open space used for assemblies and markets) aims at limiting its inhabitants’ ecologic footprints by building a vertical landscape with low energetic consumption on this last and only biggest parcel of land for residential use. It integrates the recycling of organic waste, used water, renewable energies, and various state-of-the-art nanotechnologies (BIPV solar PV, rain water recycling/harevesting, composts, etc.). The BIPV’s are placed in the pair of giant horizontal shades atop the building. Its trademark spiral is inspired by the double helix of the DNA molecule, suggestive of the life force it brings to the city. Utilizing its helical twist through a 90 degree angle (at 4.5 degrees per level in this 20- level building), it is creating a series of “suspended open-air gardens”, superimposing vertically wide planted balconies of suspended orchards, organic vegetable gardens, aromatic gardens, and other medicinal gardens. Contrary to our historical perception of “buildings”, Vincent Callebaut has created a living organism in Agora, overpassing the passive role of most buildings as passive energy-consumers. Agora is designed not only to be self-sufficient in terms of energy (electric, thermal, and alimentary), but has gone a step beyond to produce its own organic food while taking a dynamically fluid geometry! I never thought I would see a building that would be able to project our human relationship to nature and our environment so musically! It is truly a Helical Force of Life! I will look forward to the date of its completion. Until 2016, I invite you to visit Tao-Zhu Gardon or Agora Garden of Taipei, Taiwan by Vincent Callebaut Architectures and hope these dreamers in Taiwan will be bringing this Helical Force of Life into reality.